The summer arrived in Shanghai, school finished and that means – time to leave Shanghai!! The kids last day of school was June 27th and on the 28th we were all on a plane heading back to the UK. Both children had EXCELLENT school reports – which obviously made us very proud. They are happy, excelling and trying their best at whatever they do – I cannot ask for more. We arrived to glorious weather in the UK. Blue skies, brilliant sunshine and heat! We spent several days with family: my parents had celebrated their 50th Golden Wedding Anniversary earlier in June so we had a family meal out to celebrate. It was wonderful to see Isabelle and Oliver re-connecting with their cousins – they picked up as though it was only yesterday that they had seen them! 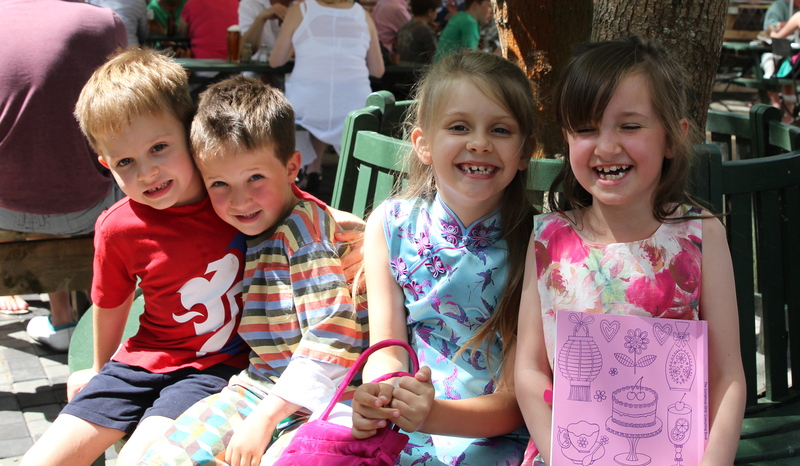 Front – Isabelle, Maeve, Oscar and Oliver. We also had a brilliant day with my favourite Uncle and Auntie who live in a lovely village next to a Country Park that the kids loved. Then it was off to Germany! We flew into Munich and drove 1.5 hours to Steinberg am See in Bavaria, passing lots of hops growing on the way – it is beer country, after all! What a wonderful reunion with Steffi! 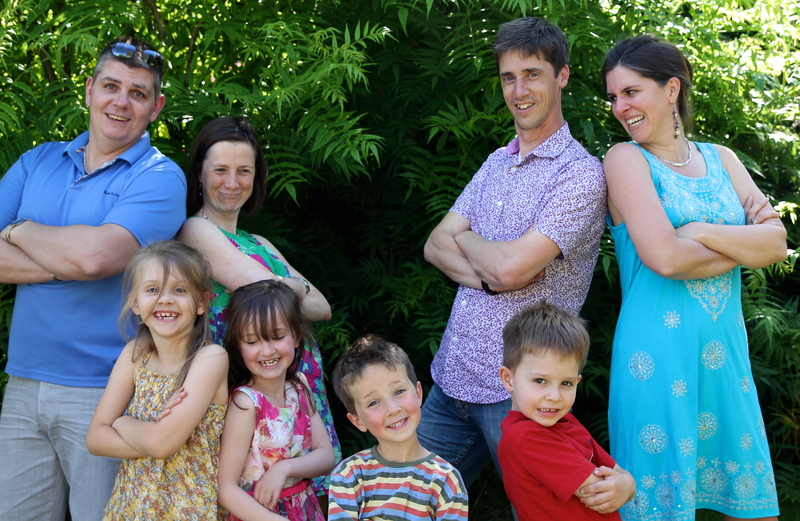 Steffi was our first Au Pair in America and quickly became a part of our family. She has visited us many times since she returned to Germany and we keep in close contact. It was our turn to visit her, especially to celebrate the occasion of her wedding! 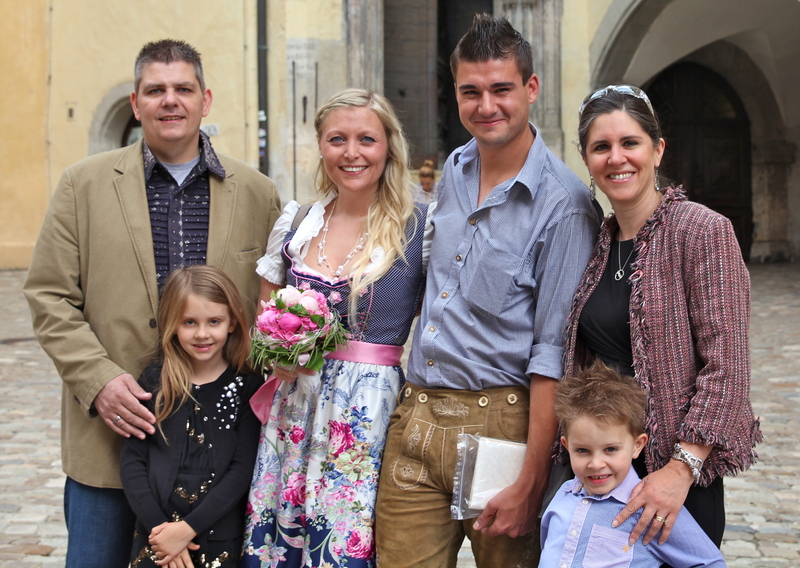 Even though we had not met her Fiancé, Heiko, before this trip, he and his family welcomed us although we were family members. Both sides of our “German family” treated us so well and we felt like we were at home. We had a couple of days to settle in, re-connect with Steffi’s friends and family, before all the festivities started. First was the “official” wedding. 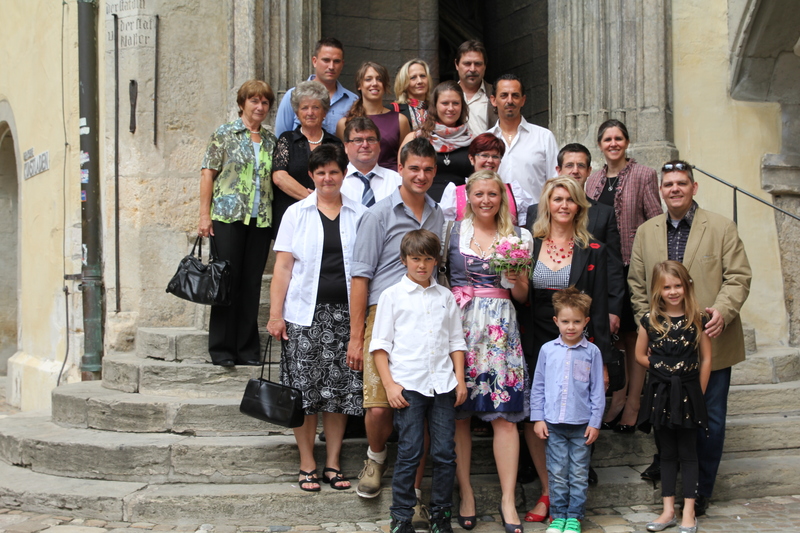 This event was in Regensburg at the Rat House (Town Hall) and was just for immediate family. We were shocked and stunned to find that we were also invited to this celebration. After a short ceremony, with Steffi and Heiko in traditional Bavarian costume, it was off to a lunch celebration. Just Married (first time!) In Regensberg with Steffi and Heiko. Immediate family (plus us) after the ceremony. 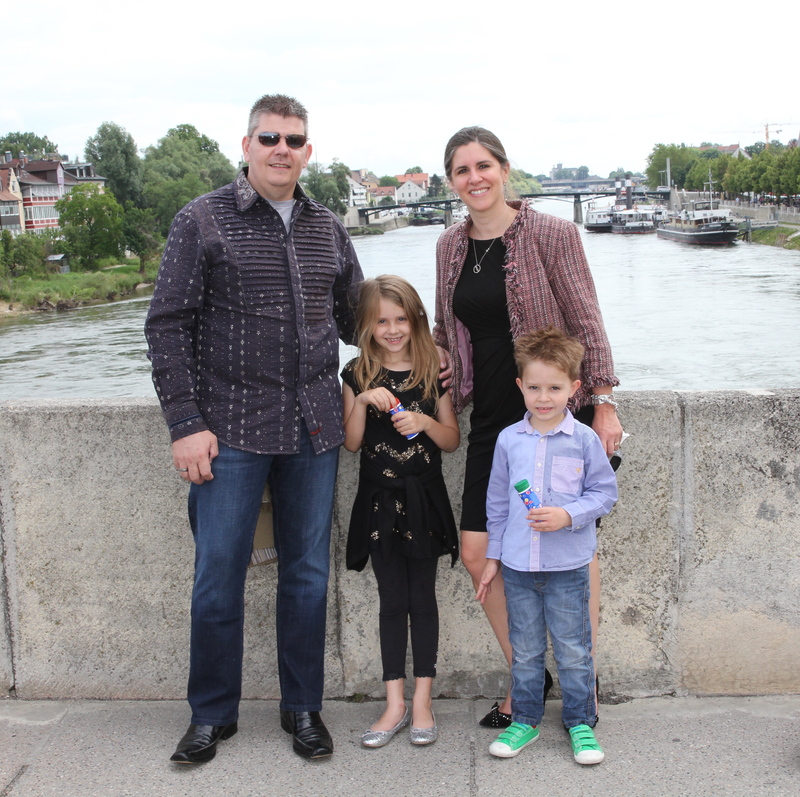 Stopping for photos on a bridge in Regensburg after the Town Hall ceremony. On our way to lunch! It was a lovely walk through the town and many people commented on the new bride and groom. We were lucky with the weather here too, as they have had so much rain that many areas had been flooded. But, it was sunny and hot with beautiful blue skies for our whole week in Germany. The town hall wedding was on Thursday, with the church service on Saturday. So, Friday we went to the “Moving Ground” which is a large play area by the huge lake. There was so much for us to do there and we had a lot of fun on water slides, trampoline bungie jumping, normal trampolines and a giant inflatable bouncy dome. Enjoying the Moving Ground at the “Am See” part of Steinberg! Fantastic things to do for the kids – big and small. We woke to another beautiful day for the wedding. 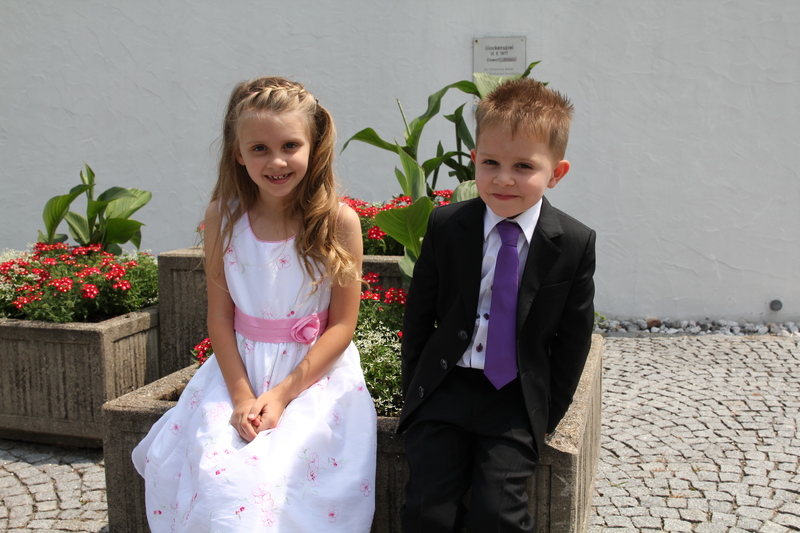 Rushed off to get Isabelle’s done – as flower girl/bridesmaid she had to look perfect! Oliver also got his hair cut so he would look super smart in his new suit! Posing by the wedding car. The flowers made it to the church, lake and reception! The wedding was so much fun. Even though it was all in German and I could only follow bits of what was going on, the atmosphere was terrific. 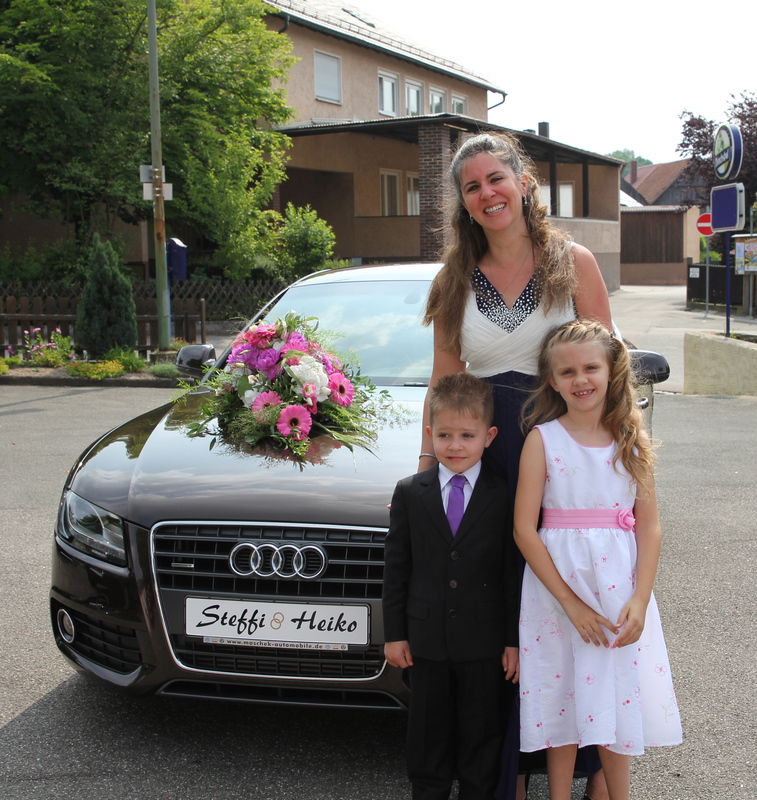 All of Steffi and Heiko’s friends and family were so open and friendly. Steffi, of course, looked absolutely gorgeous – Isabelle thought she looked like a Princess. After the church service, we went to a local cafe for cold cuts and beer. This is when Steffi and Heiko were off at the lake having photos taken. Meanwhile we were all socialising and enjoying the sunshine. Once they returned we then drove in a long convoy to the reception hotel about 10 minutes away. Even this was fun as all the cars were honking their horns and driving in a wavy crocodile fashion. 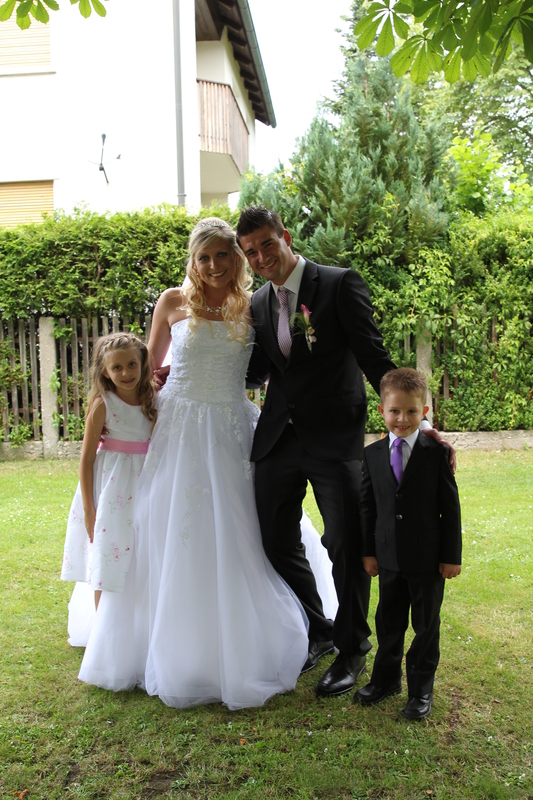 The beautiful bride and groom with 2 wonderful children! The flower girls, plus Oliver and Patrick (Steffi’s nephew). There was traditional Bavarian music playing as we arrived and it was time for coffee and cake. Heiko’s mum and Steffi’s mum had spent several days making the most gorgeous range of cakes for this part of the day. We all ate several! While everyone was enjoying the cake, the music kept playing and the dancing started. Then it was time for the “Bride Stealing”!! One of their friends stole Steffi to another location and Heiko now had to win her back. We all walked to another restaurant to the bride’s secret location and enjoyed some games while waiting for the Groom to come and rescue Steffi. This was very different from any other wedding we have attended and we all enjoyed this part. After several humiliations on Heiko’s behalf, he won her back and we returned to the restaurant for dinner and more dancing. 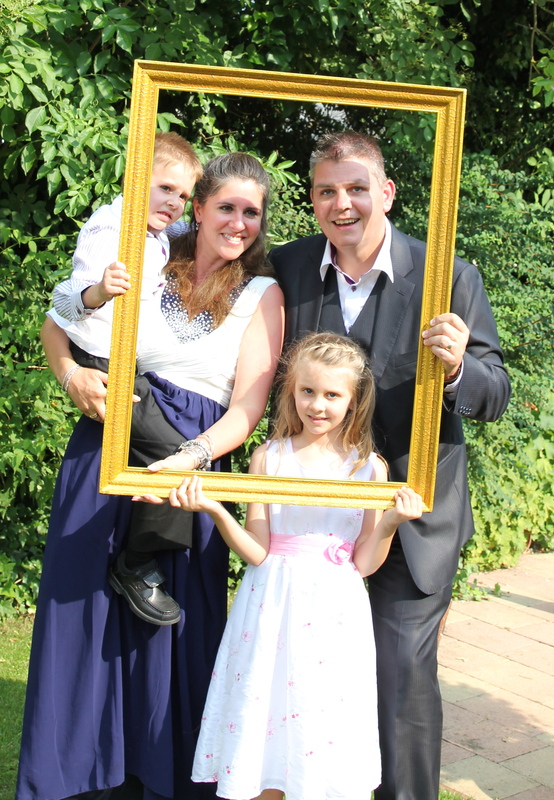 All of the guests had their picture taken with the frame – it will make a lovely photo album for the happy couple! We spent the next couple of days enjoying the Moving Ground at the Lake, site seeing in Schwandorf and the Pony Hof in Steinberg. Steffi and Heiko have delayed their honeymoon until later in the year, so we spent these days catching up with them and relaxing after all the lead up to the wedding. We took some boats out on the lake – one even had a slide on it that the kids loved. I had a go at water ski-ing which I had not done since living in America. I had also never water skied on a cable system before so it took a couple of attempts to master the corners of that! (I ached soooooo much the next few days after!) 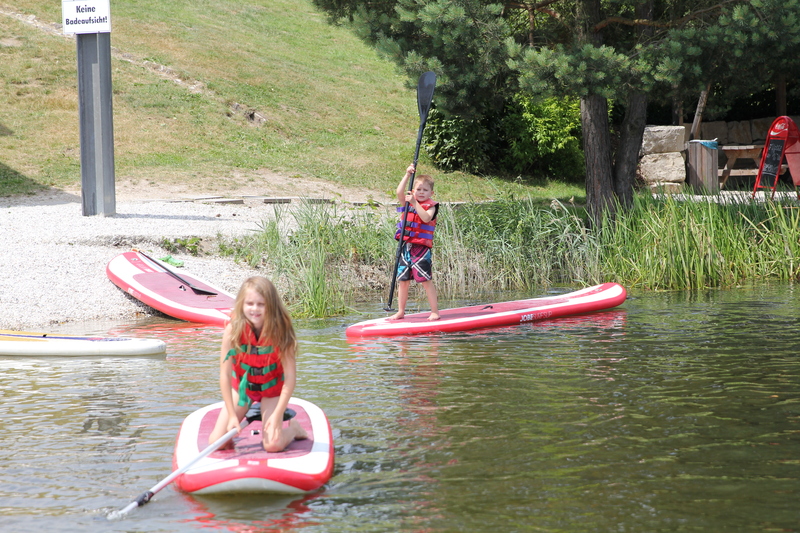 Both children mastered the paddle boats while I was water ski-ing – displaying great balancing skills. They had plenty of fun in Germany! Isabelle and Oliver had swam across to Steffi and Heiko’s boat. Both of them stood up and could work these boards. All too quickly our time was up and we had to return to the UK. It was a fantastic visit and so wonderful to be able to see our lovely Steffi get married. Back in the UK and time to catch up with other family members and friends. It is always a whirlwind visit and impossible to see everyone. Mum and Dad babysat a couple of times so that Owen and I could enjoy adult nights out with Laurence and Mark & Sandra. 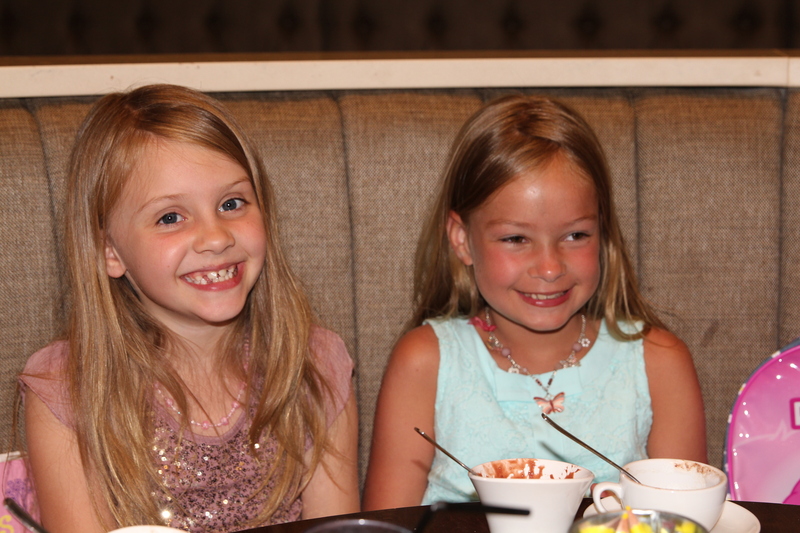 We also arranged for Isabelle and Oliver to see special friends from the UK. It was a joyous reunion and Isabelle was especially thrilled to see her best friend again. The 2 of them were thick as thieves, just like they had never been apart. 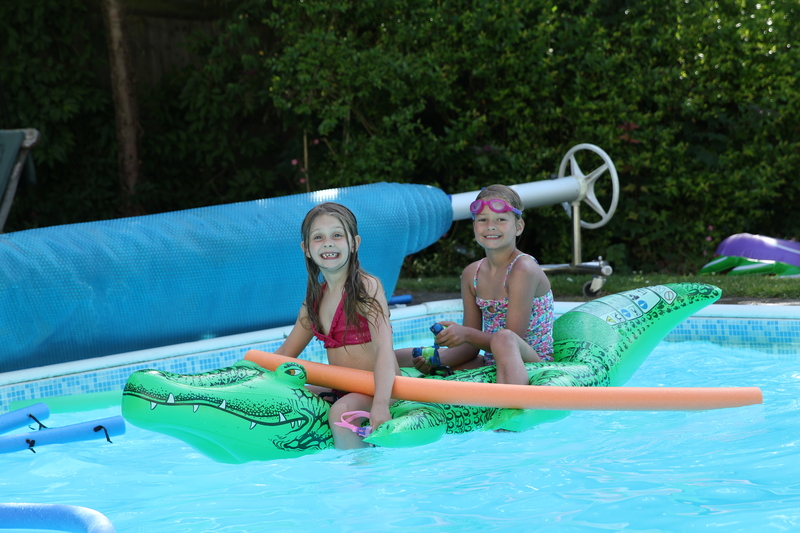 Isabelle and Aimee spent the entire day in the pool! 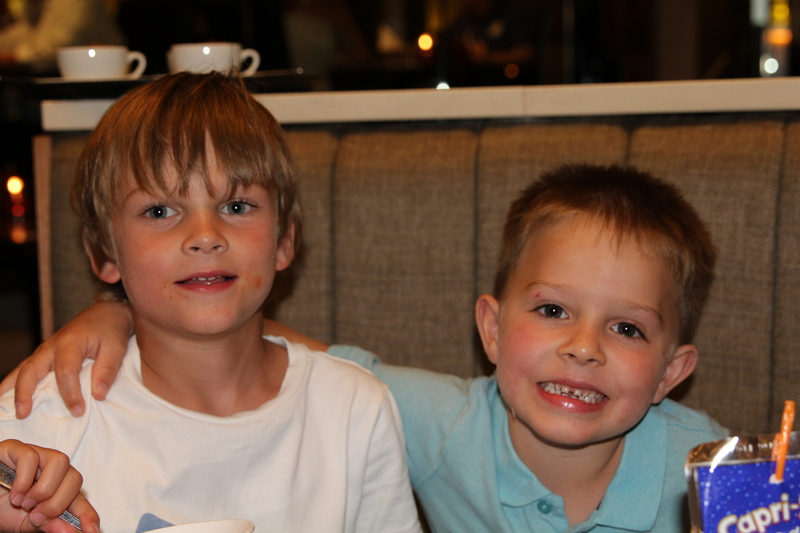 Sam and Oliver – 2 buddies back together! The giggling did not seem to stop between these 2. 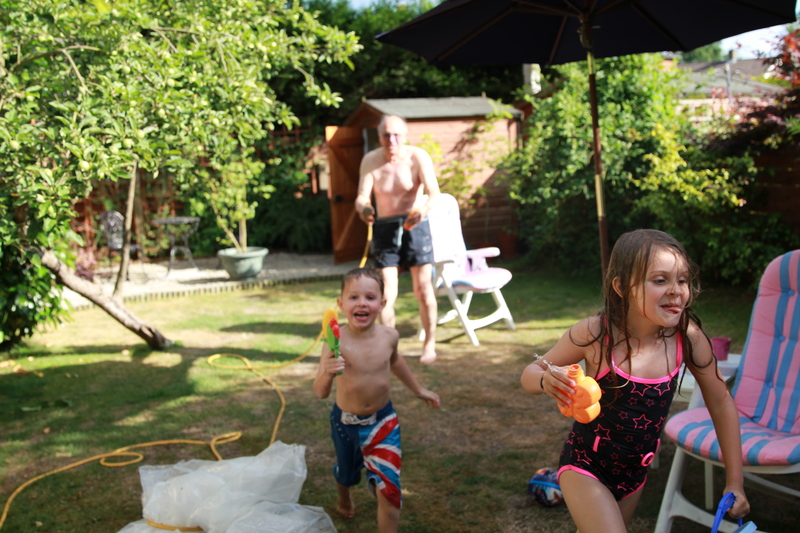 Grandad soaking the kids in the garden. He also got a little wet from their water pistols! We had 1 scare with Oliver – a severe allergic reaction to something (probably peanuts) meant a visit to the A&E / ER to reduce the swelling and rash. He is now going for an Allergy panel test to let us know exactly what we need to avoid. He gave us all a scare though. I returned to Shanghai after 3 short weeks away, leaving my 3 loves in UK. It is heart-breaking to be apart and I miss them all dreadfully. But, they would all be so bored in China as no-one is here. So, I am busy working, working, working and trying to stay out of the blistering heat and humidity that is Shanghai in July and August. It is countdown mode for me until they return.